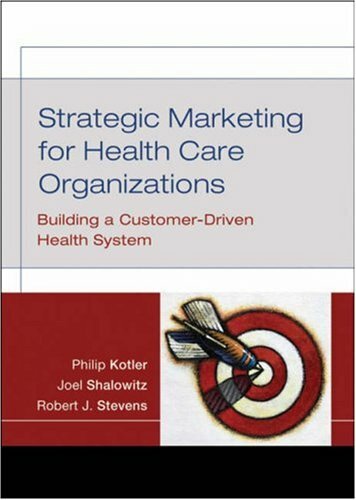 This much-needed text offers an authoritative introduction to strategic marketing in health care and presents a wealth of ideas for gaining the competitive edge in the health care arena. Step by step the authors show how real companies build and implement effective strategies. It includes marketing approaches through a wide range of perspectives: hospitals, physician practices, social marketing, international health, managed care, pharmaceuticals, and biotechnology. With Strategic Marketing for Health Care Organizations, students and future administrators will have a guide to the most successful strategies and techniques, presented ready to apply by the most knowledgeable authors. world. In addition to his academic research and teaching, Professor Schultz maintains an active schedule of training and consulting with organizations interested in developing and implementing principles of social marketing. He has worked on projects for a variety of organizations, including the Environmental Protection Agency, National Institute of General Medical Science, National Institute of Justice, Keep America Beautiful, California Integrated Waste Management Board, and Opower. His work has been featured in Business Week, the NY Times, BBC International, National Public Radio, Time Magazine, and numerous other media outlets.Philip Kotler is the S. C. Johnson & Son Distinguished Professor of International Marketing at the Kellogg School of Management, Northwestern University, Chicago. Kellogg was voted the ï¿½Best Business Schoolï¿½ for six years in Business Weekï¿½s survey of United States business schools. It is also rated as the ï¿½Best Business School for the Teaching of Marketing.ï¿½ Professor Kotler has significantly contributed to Kelloggï¿½s success through his many years of research and teaching there.He received his masterï¿½s degree at the University of Chicago and his Ph.D. degree at MIT, both in economics. He did postdoctoral work in mathematics at Harvard University and in behavioral science at the University of Chicago.Professor Kotler is the author of Marketing Management, the most widely adopted marketing book in MBA programs; Principles of Marketing; Marketing Models; Strategic Marketing for Non-Profit Organizations; High Visibility; Social Marketing; Marketing Places; Marketing for Hospitality and Tourism; Museum Strategy and Marketing; Standing Room Only; The Marketing of Nations, and Kotler on Marketing. He has published over 100 articles in leading journals, several of which have received best-article awards.He has been Chairman of the College of Marketing of the Institute of Management Sciences, Director of the American Marketing Association, Trustee of the Marketing Science Institute, Director of the MAC Group, former member of the Yankelovich Advisory Board, and member of the Copernicus Advisory Board. He has been a member of the Board of Governors of the School of the Art Institute of Chicago and a member of the Advisory Board of the Drucker Foundation. Philip Kotler is the S.C. Johnson Distinguished Professor of International Marketing at Northwestern University's Kellogg School of Management and the author of more than thirty books.Joel Shalowitz is professor of Health Industry Management and director of the Health Industry Management Program at the Kellogg School of Management and professor of Medicine and Preventive Medicine, Feinberg School of Medicine, Northwestern University.Robert J. Stevens is president of Health Centric Marketing in Durham, North Carolina and an adjunct professor at the School of Public Health at the University of North Carolina at Chapel Hill. Robert J. Stevens is a graduate of Brown University and New York University School of Law. Inspired by his son, Robert became an educational consultant in 1998. While helping to shape and refine various curricula for learning centers and in-school programs, Robert has accumulated thousands of hours of hands-on experience with children struggling in school. Along with other educational and developmental experts, Robert created the Spark Development & Learning Program for children with attention, learning, and behavioral issues.